By Rev. Philip Dabney, C.Ss.R. When I was a young boy, probably younger than Mary in the gospel, I used to like to sing a lot. This may sound strange, but you see, my mother, she knew me really well. She knew that my singing was a sign of joy, especially at those times I was trying to cope with sadness, or boredom of doing a chore, or just being tired. Who was the saint who said that “to sing is to pray twice?” I think that when we are in touch with the deeper dimension of our being, that place where words are too deep to be expressed, a song can say what is deep within our hearts. She knew from her praying of the psalms, that the psalmist expressed words of prayer in song. Mary also knew that other women poured out their souls before God particularly when they were deeply distressed. Hannah, who longed for a child, and had been blessed with Samuel, sang a song of joy and gratitude, after she had consecrated him to God. And many of the sentiments in her song echo Mary’s Magnificat. What does a young woman do with all of this mystery? Well … Mary eventually sang her Magnificat. We must ask ourselves, what is the cause of her joy? Mary is joyful because she realizes that all the promises of God are now fulfilled in Christ Jesus, the child within her womb. And this joy of hers is always with her no matter what, regardless of what happens to her. He was not referring to the feeling of joy: that is never in our power. No, he was speaking of an essential joy rooted in his recognition that God is gracious, that the grace of God is made flesh in Jesus, that Jesus is Emmanuel, God-with-us. Joy comes when Christ comes; joy is where Christ is. We can see this deep joy at work in people’s lives. There are those who may lack a physical pain, but in the circumstances of their lives know mental anguish and stress. Again, we see the joy of faith that breaks through their pain. The poet Gerard Manley Hopkins, meditating on Our Lady’s sorrows, wrote in his diary: “Christ’s joy in spite of sorrow, wish to enter into this.” Joy in spite of sorrow, joy in the midst of pain! How can this be? Because God is gracious and the face of his graciousness, his mercy, his compassion, his love, is the face of Christ, and Christ is Emmanuel, God always with us. Mary can truly be our source of joy. For no one has such an abundance of joy to give as Mary does. She proclaims this joy in every line of her Magnificat. Her soul rejoices, magnifies, exalts in the wonders of God. And she invites us to come to her, so that she might bring Emmanuel into our wounded hearts, to shine on our darkness, so that our nights are no longer dark but bright as day. 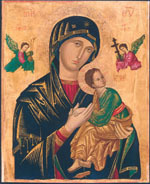 Mary, Our Mother of Perpetual Help, not only promises to “help” us always, but her title also suggests that she has countless “helps” to offer us, “gifts” to help us live our lives in the fullness of God’s loving embrace. As we remember our loved ones who are suffering today, in any way, as we become aware of our own suffering, let us remember to ask Mary to help us — gift us with her deep joy.